New pork internal cooking temperature is now 145 degrees. Not sure how to use a meat thermometer? Find out here. Cooking to 145 degrees ensures safe and tasty pork. Pork is now leaner than ever. Find out other nutritional information about pork. I can’t think of anything better than a plate of Pork Fajitas, Pork Quesadillas and Pork Sliders. Enjoy! In large bowl, stir together the pork, cheese, peppers, onion, cilantro, salt and pepper. Arrange one-eighth of the filling on each tortilla, covering half of it. Fold the tortilla over to make a half-moon. 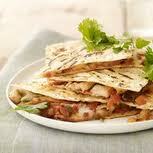 Place quesadillas, not touching, on shallow baking pans. Bake in 500 degree oven until tortillas are crisp and golden, about 5 minutes. Transfer to large cutting board and cut into wedges to serve with salsa. In shallow bowl, toss pork pieces with fajita seasoning. In a large non-stick skillet over medium-high heat, stir-fry pork pieces with onion and green pepper until vegetables are just tender (about 5-10 minutes). Wrap portions in flour tortillas with salsa. NOTE: Did you know that pork tenderloin is lower in fat than a skinless chicken breast? 2.98 g. fat for pork tenderloin compared to 3.03 g. fat for skinless chicken breast! In small bowl, combine onion, red wine vinegar and 1/2 tsp. salt, stir to dissolve salt. Let stand at room temperature for 2 hours, stir occasionally. Meanwhile, preheat oven to 450 degrees. Season tenderloin on all sides with salt and pepper. Place tenderloin in shallow pan and roast for 20 to 25 minutes, or until internal temperature reaches 155 degrees. Retrieve pork from oven and let rest 5 minutes.